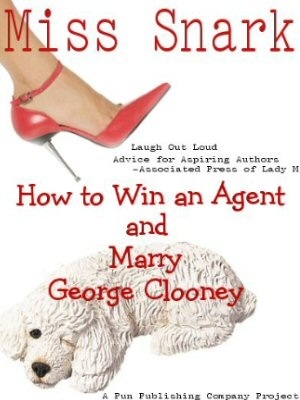 Miss Snark, the literary agent: Daunt me no daunt! Thank you! You give up to those of us who have been working intently for years. I believe in the slush pile. Slush-pile submitter with a contract from Penguin waddling to duty, Sir! All of this means very little if the writer's story doesn't work from the start. He could write an awful story with every cliche under the sun and have the prose of a ten year old, pay for a ticket to a writer's conference to meet an agent--but he will still have the same luck with queries because the story needs to work first. You won't get your foot in the door no matter what you do if the story doesn't work. Even an organization is no guarantee of finding good writers. I was looking at a regional organization that's been around for 88 years. Sounds like they might have a lot of successful writers, right? Every single one of the "published" writers had self-published. Those Organizations are no guarantee of anythng other than meeting people--and that doesn't necessarily mean the right people. It still all comes down to the story. Of course, the ratio of fiction to non-fiction slush may skew in favor of non-fiction slush being a better bet. Something seems wrong when publishers start turning to agents to prescreen their submissions and agents seem like they need prescreeners of their own to keep up. I believe in the slush pile, too. I didn't know anyone in the industry; I live in the wilds of Georgia. It happens. Miss Snark, this post left me with a big shiny helium-filled "Yay!" bouncing around the interior of my skull. Ta, muchly. It has been my impression that agents come in two varieties - those who get most of their new clients from referrals, and those who get most of their new clients from slush, with contests and conferences being quite minor. The ones who get the majority of their clients from referrals tend to be so famous and successful that they get more good clients referred to them than they can ever take on. Don't allow yourself to get scared by statistics. If you ever get any exposure to real slush you'll realize that about 90% of it is written by obvious nitwits. It's like being in a race where a few people are professional athletes but most are 8-year-old kids. I think the slush pile needs to be renamed; after all, words have power! How about it being a haystack instead? As I interpret what you've explained, every new author has to be in the haystack at some point. Even a referral would have to have been found in another agent's haystack first. It's like being in a race where a few people are professional athletes but most are 8-year-old kids. I had to laugh at that one....You haven't been hanging around 8-yr-old kids!! I am curious which genres have the largest slush piles. In children's writing, picture books aren't in as much demand. But YA is in demand. Yep, eight-year-old kids do go and go. But they still can't win races against professional athletes. "... and when I started up, more like 85%." So the moral of the story is to target new agents. Thanks, I'll keep that in mind during my research - big agency, big reputation, new agent - done.